Everyone has a price. For a freelancer designer, it can be difficult to get that price—especially when clients have a set budget in mind. Does this mean that you should compromise your talent, time, and worth? Not necessarily. 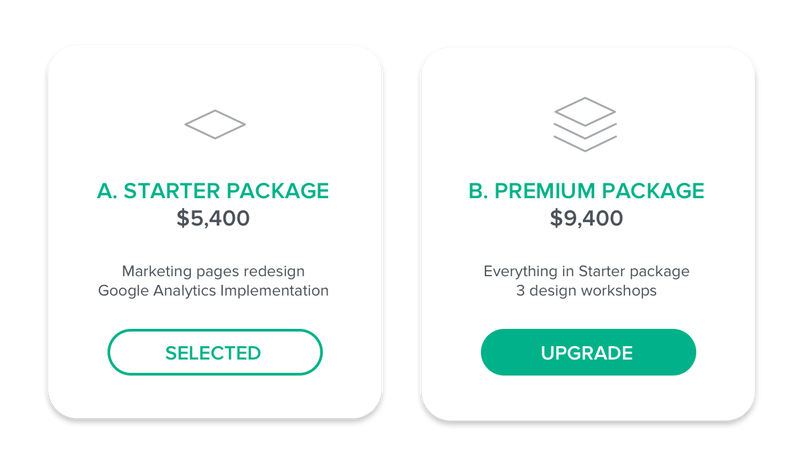 The most successful freelance designers are comfortable setting top-tier pricing and sticking to it, even if it means missing out on projects. This may seem risky to someone starting out or barely making it. (Who can afford to turn down work?) If you’re willing to commit to only doing profitable work, however, I can guarantee the results will speak for themselves. After speaking with thousands of designer using Bonsai and looking at their freelance rate, we were able to put together 5 strategies the highest-paid designers use every day—no special selling skills required. If you need $40,000 a year to live on, and you will spend a flat rate of $10,000 for all the business tools you need (software, hosting fees, training, etc. ), then your costs would be $50,000. Divide that by the number of hours you plan on working each year (1800 hours for a 35-hour work week minus vacation), and you’ll get around $28 an hour. Add on any tax liability for a job done, and you have your minimum acceptable rate. Pro tip: This is the bottom-line cost of your time, but it should never be your starting point. Consider this price your absolute last resort. If a potential client wants to go lower, you should be able to walk away, knowing it would have been a losing proposition for you. Do you know what a UX designer from your part of the country makes with just 1-3 years of experience? If not, you’re at a huge disadvantage. You could be asking too much for your work—or even too little! The best way to come into negotiations with the confidence that your rates are fair is to know what everyone else is charging. 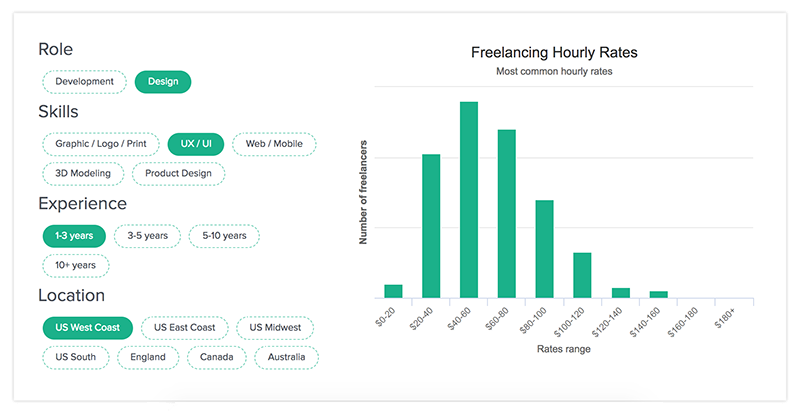 Pro tip: The freelance rates explorer tool has compiled the contract rates from 40,000 designers and developers for a variety of expertise categories. See if what you’re charging is low for your industry, and make it a point to move toward the middle of pack in terms of payment expectations. If your request for a rate you consider fair isn’t accepted, you have options other than lowering your amount. The most effective (and respected) method is to offer something additional for the same rate. Clients who feel like they are getting a “bonus” or a “freebie” are more likely to respond to what they see is a premium price. The key to making this a value to you is to choose your bonus services wisely. What type of add-ons would bring value without much additional effort? They could include extra digital files of work you’re doing, extended rights or licenses, an extra round of revisions, or a shortened turnaround time. Anything that can be provided without you having to create anything is fair game. When a negotiation looks like it won’t end well, toss one of these options in as a premium feature and see if things go your way! Pro tip: For best results, use this method in a proactive manner, not as a last resort. By supplying a potential client with 3 tiers of pricing up front, you can work these add-ons into your scope from the very beginning. Make sure that the bottom tier represents minimum features and your lowest desired rate, the middle tier is your ideal rate with industry standard features, and the top tier lists all the premium offerings and your dream rate. You’d be surprised at how many clients go for the most expensive option! Even with the perfect agreed-upon rate in mind, there’s a danger zone for freelancers that you should be careful to steer clear of. 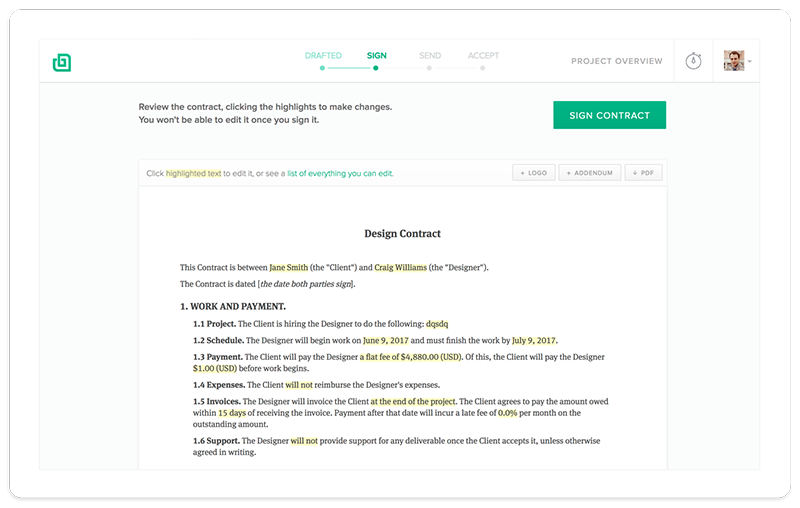 It’s called “scope creep,” and it’s the most common rate-killer for designers and developers. Sometimes, clients will accept a rate for services, but then request small changes, add-ons, or favors as the project progresses. These can derail the original plan and take up more of a freelancer’s time, severely cutting into profitability. Which projects took longer than I anticipated? Was this due to more work on my end? Or was there a hold-up from the client? What new skills did I need to learn on the fly? Would I consider these to be outside of my expertise? When a client asked for something extra, how did I respond? Was there a way to write this into the contract from the beginning? If not, how can I say “no” without jeopardizing the project? Pro tip: Your answers to these questions should be honest. Avoid being hard on yourself if you were a victim of scope creep in the past. Resolve to learn and move on, using the hard lessons to make future projects more profitable. The most successful freelancers have years of experience behind them, and many of those years contain more than a few errors. Understand that it is rare (if not unheard of) for a company to actually pay a higher rate down the road. It’s more likely for them to hire someone else for that same low rate. (If you were okay with it, why wouldn’t someone new be, too?) Stand your ground with rates, and don’t ever start a contract with the promise of something better down the road. Unless, of course, that promise is written in ink in the form of a contract with the new, higher pay rate guaranteed by a certain date. Pro tip: Some new startups have gotten away with paying lower rates with the promise of a variety of other benefits. These can come in the form of commission, profit-sharing, equity, or even publicity and exposure. Remember that you have a business to run , and that if you wanted to invest in something, you have your choice of established and regulated markets to choose from. Don’t turn your hard-earned sweat equity into stock in an uncertain company. Only cash will pay your mortgage bill. Now that you have the facts about negotiating your rate, it’s up to you to follow through. There are designers out there making a handsome living doing what they love, at a price that works for their budget—and their dreams. What’s holding you back from joining them? Take a look at the 7 common mistakes to avoid on your next design proposal. Marketing and partnerships at Bonsai, the all-in-one solution that helps freelancers get more done with less hassle. Fan of digital marketing, UX, and sports.